George W. Bush is the worst President in American history. In less lucid moments (mostly when hopped-up on allergy medicine) I would write that Barack Obama has been far far worse. But there would have not been Barack Obama in the White House had Bush the Lesser been a competent leader. I spent more time than I cared to during the Bush years chronicling and commenting upon that maladministration's screw-ups, and I sure don't want to spend any more time on it than I absolutely must (some readers of this blog have commented that I'm too hard on Obama, even "hateful". Where were they during this site's first several years?!). All I will say for now is this: in regards to the Department of Homeland Security: I told y'all so. Way back in 2001 even, I wrote in a few places that Bush was giving us something in Homeland Security and the Transportation Security Agency that we would soon come to regret and that in time it would become a tool of harassment by our own government. Clearly when an active-duty Marine serving in spite of losing both legs to an IED gets humiliated by TSA agents, something is very very wrong. The country that we insisted be Iraq could - and can - only function when there is a "strongman" figure to keep the ethnicities and sects within its borders from killing each other. That is the role that Marshal Tito had in Yugoslavia and that is the role that Saddam Hussein had in Iraq. Just as Yugoslavia imploded into civil war a decade after Tito's death, so would Iraq in the absence of Hussein or a successor just as brutal. As it is, the United States sought - and claimed - the mantle of strongman over that distant land. The war itself has cost $1.7 trillion and climbing. Medical and veterans' benefits will have it costing over $6 trillion across the next forty years. $490 billion is already owed to veterans. More than 134,000 Iraqi civilians have been killed. 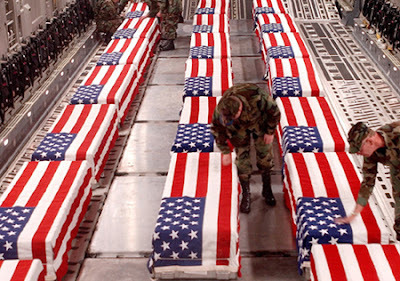 More than four thousand American service personnel have died in Iraq. Ten years ago we were told that Saddam Hussein was harboring chemical and biological weapons. There were none. Ten years ago we were told that Saddam Hussein had conspired with the 9/11 terrorists. He had not (a theological improbability, that was: Hussein's Iraq was a largely secular state fully at odds with the goal of sharia law which Al-Qaida has sought). Ten years ago we were told that a democratic Iraq would be the wellspring from which freedom and liberty would burst across the Middle East. It did not do that either. Ten years later and as the much-ballyhooed Arab Spring has demonstrated, the Mid-East has far less freedom than before. Making matters worse is that following the departure of American forces from Iraq, that land will almost certainly become a territory of Iran. In some ways it already is. I understand that in this fallen realm of our temporal life that war is going to happen. It is, after all, a product of human nature: something which beyond the mercy of higher authority is a vile and loathsome thing absent of all virtue. My friends of more pacifist leanings are blessed with a grace to turn the cheek and look away from the strife of the realm completely. I however do not have such grace. Indeed, I am a historian by training: I gave up that grace a long time ago. So it is that I am not ignorant of war and its place in this world. But neither is war something which should be entered into on the most flimsy of rationales. There is nothing glorious or magnificent about war. Regardless of its cause, war is always... always... a failure on the part of those involved. War means that a person or persons or even an entire nation can not or will not be persuaded that their actions are wrong and must be made to cease. That the cost of their failure must now be either surrender or death. More than 134,000 non-combatants in Iraq, men and women and children, who have died since we first attacked that country ten years ago tonight. Perhaps it is easy for some to see the numbers and not think much about them. But every one of them was created by God and precious to Him. Whether they perished at the hands of their own country's soldiers or inadvertently on our part, they deserve better than to be swept away as "collateral damage". If that doesn't impinge on the conscience, consider the more than four thousand families across America who have lost a loved one in Iraq. Those men and women, as all who serve in the armed forces of the United States, took a solemn oath to protect and defend this country and her people. They chose to surrender years of their lives - years which could have been spent in school or starting careers or getting married and having children - to the service of others. They did so fully aware that the possibility existed that they might be called upon to enter the theaters of war. That doing so would place their lives in peril. And yet they volunteered. Maybe it's just me, but it seems that this kind of personal sacrifice demands a lot more respect and even sanctity from our alleged leaders. A man or woman who puts on the uniform and swears to serve this country is expecting that their time and effort and if need be their very lives will be utilized with deepest wisdom and utmost restraint. That has not happened in the war with Iraq, ten years old today. Four thousand of our best and brightest have perished halfway around the world and we've nothing to show for it. Four thousand brilliant souls, extinguished forever from the Earth. They deserved better. We deserve better. I've only heard one cause for war with Iraq that has had any scrap of fact-based rationale behind it. It was when President George W. Bush told a crowd that Saddam Hussein "tried to kill my dad." And yes, Hussein did attempt to do so when the elder Bush visited Kuwait in 1993. But was that enough reason to commit billions upon billions of taxpayer dollars and hundreds of thousands of U.S. service personnel toward removing from power? A few months after the invasion of Iraq, Bush the Lesser told the militants in Iraq that U.S. forces would not be dislodged. That they were welcome to try though. George W. Bush told them to "Bring 'em on." Again, maybe it's just me, but a war is too horrific a thing to justify with a personal vendetta or a temper tantrum. We gained our great grandchildren underwater in debt, a police state and Karl Rove. Now be a good American and stop thinking for yourself.